Olivier Giroud has been a very divisive striker in recent years, mostly during his time at Arsenal and with the French national team. 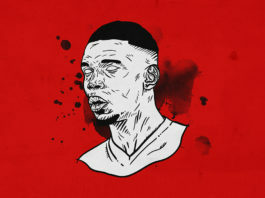 For me, he’s been a player I’ve liked since his debut season at Arsenal even though his scoring record may not have been the best at the time. 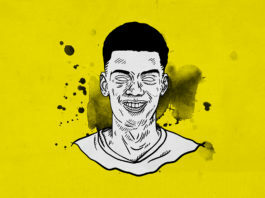 This summer has seen something very similar as despite not getting a shot on target in the World Cup, he was one of France’s most important players. For many years, he’s been the favourite of Didier Deschamps, which has seen him become France’s 4th all-time top scorer tied on 31 goals with Zinedine Zidane. However, here’s what he brought to Les Bleus in Russia and how he matched Zidane for a World Cup winner’s medal also. Coming to the end of his Arsenal career, to my disappointment, Giroud was mostly used as a super sub. 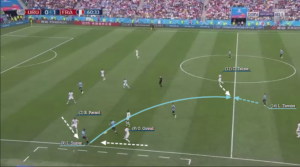 In France’s World Cup opener against Australia this was the same as Deschamps seemed to move away from the style that helped France to the Euro 2016 final and use pacier players in a 4-2-3-1. However, as France struggled, Deschamps decided to revert to the more familiar style of play, bringing on Giroud late on. In this instance we saw one of Giroud’s strongest attributes come into play which was his link up play. 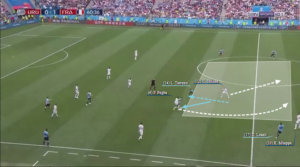 As you can see in my analysis of Paul Pogba, this lead to the goal that in turn got France off to a winning start this summer. Something that can’t be underestimated. Following this cameo, Deschamps brought Giroud back into the starting line-up for the rest of the tournament which is when we saw France at their best. For France to work effectively, Giroud had to be very selfless throughout the tournament despite playing to his strengths. I’d say that in my time watching Arsenal, Giroud has one of the best touches of a football I’ve seen from any player and this was no different in Russia. What this allowed France to do was use Giroud to occupy opposition defenders high up the pitch, creating space in behind for either Griezmann or Mbappé to exploit. This also brought Paul Pogba into games who proved to be instrumental throughout the tournament. Here Pavard has cleared the ball high, knowing Giroud will in a position to fight for the ball. Giroud occupies two Croatian players and calmly lays the ball into Pogba’s path. 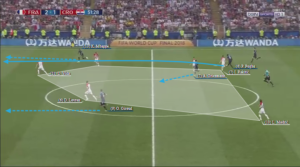 As a result, the Croatian defensive line is out of whack giving Mbappé space in behind to attack. However, as Giroud makes his way into the box, an even bigger space is created in between the defensive and midfield lines. 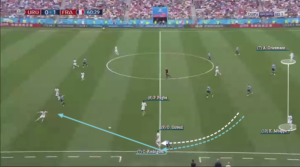 This is an aspect of France’s game that was very apparent in Russia and helped then advance up the pitch quickly and effectively. This specific type of counter attack was also evident for Pogba’s goal in the final which followed a very similar pattern in terms of the passes played and spaces created. This is something that was only possible due to the great target man play from Giroud. The French team were exactly that, a team, as everyone seemed to know exactly what to do and when to do it. 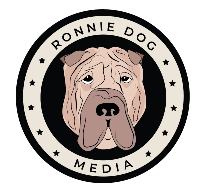 Throughout the tournament we could see that Griezmann and Mbappé were France’s main attacking threats but that also came from Giroud’s sacrifices. 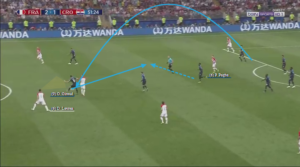 Knowing the strengths of his side, once in the knockout stages, Deschamps had his side working like a well oiled machine and here is how Giroud helped when France were without possession. Leaving Griezmann and Mbappé up top for a possible counter, Giroud drops in to press the ball. This time hunting down Cristian Rodriguez who panics and plays the ball into Suarez. Suarez does well to lay the ball back but Giroud is still determined to come out on top and gets a foot on the ball. Giroud and Pavard then put the squeeze on Suarez on the touchline. Without much space to manoeuvre he plays the ball into Lucas Torreira but this becomes a 50/50 with Tolisso. Torreira wins the 50/50 but not convincingly. 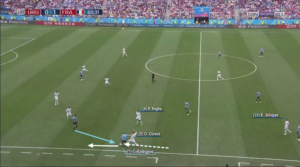 The ball bounces into the nearest Uruguay player but Pogba anticipates this well and drives into the massive space left by Torreira with Tolisso for what became Griezmann’s goal. This was also an aspect of Giroud game that was vitally important to France winning the World Cup as he continued this in every knockout game, especially in the semi-finals and the final itself. As well as his pressing leading to France’s two-goal cushion against Uruguay, this helped stop various attacks at the source. 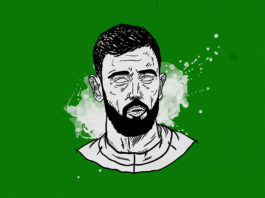 We saw this against Belgium as he dropped in time and again and against Croatia where more often than not he pressed their centre-backs higher up the pitch instead. All in all, in order to succeed this summer, France needed a number of different tools to work efficiently. 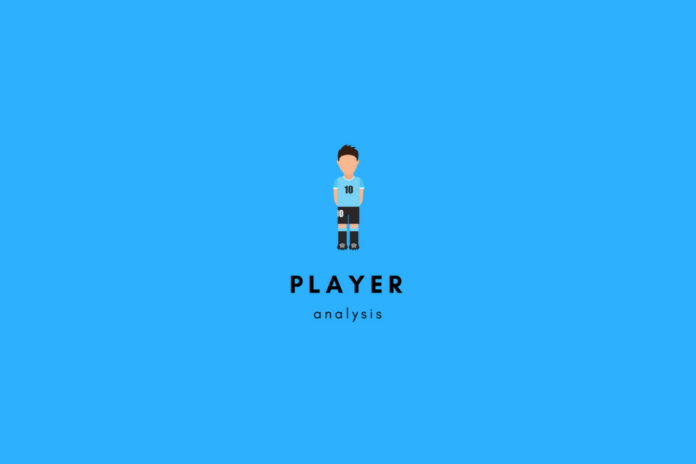 For Giroud, he was a vital tool in being the first link in a chain reaction that allowed Pogba, Griezmann and Mbappé to go and express themselves. So, despite the now-Chelsea striker failing to get a shot on target, his role in this World Cup winning side shouldn’t be overlooked or forgotten.